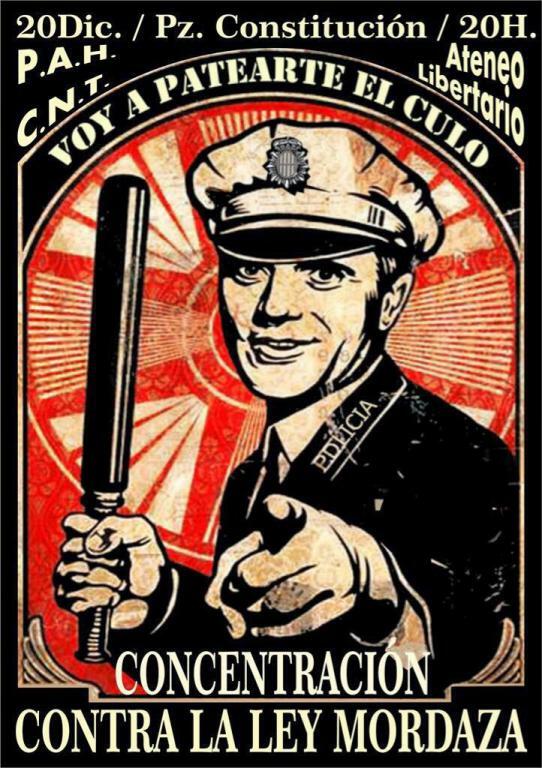 On July 1, 2015, at the very moment when the Gag Law [“Ley Mordaza”] and the latest Reform of the Penal Code went into effect, the Spanish monarchy became a Police State, concluding a stage of punitive populism that commenced in the 1990s with the Kicking Down the Door Law [“Ley de la Patada en la Puerta”] and the “democratic” Penal Code, the most draconian in Europe and the worthy heir of the Penal Code of the Franco regime that was still in force until 1995. What was until quite recently a particratic State characterized by a rampant authoritarianism emanating from a “legislative” power that was gradually infringing on rights and abolishing liberties with the help of a “judicial” power that is dependent on the parties, is now a State of Emergency declared thanks to a penal code tailor-made for the repressive apparatus. The difference is not a subtle one: until just recently, the partiocracy was based primarily on the conformism of the masses; now it is based for the most part on “the security forces and special units”. This means that, whether as a result of an uncontrollable eruption of the social question, or due to the irremediable impotence of the regime in its confrontation with the consequences of the exit of Greece from the Eurozone, political problems are increasingly perceived as security problems, that is, as problems of public order. At least a significant part of the ruling class has been stricken with panic by the threats entailed by the spreading social conflicts in the cities and the territory, the direct consequence of the economic crisis and the discrediting of institutions, and has decided that the reinforcement of the party system with new political choices is not sufficient. One part of the ruling oligarchy has more faith in the integration of the emerging parties and coalitions thanks to a policy of alliances; the other part believes more in police operations granted a carte blanche to ruthlessly repress the least sign of protest and dissidence. For the former faction, the ordinary mechanisms of surveillance and control of the post-Franco era are good enough, powerfully backed up by the legislation enacted by previous socialist governments; for the latter faction, it is purely and simply a matter of returning to the policy of enforcing order that was practiced under Franco’s dictatorship. The social pact that served as the basis for the partiocracy, represented by the Corcuera Law,1 seems to be broken. The political forces that advocate a policy of privileging “civil security” to the detriment of the currently prevailing status of rights relating to privacy, housing, asylum, assembly, protest and expression, rights that have already been significantly curtailed, think that the social situation might deteriorate and take a turn towards Greek-style consequences because the regime is too vulnerable to financial speculations, and as new budgetary deficits arise it will get even worse. In order to forestall a potential crisis with another bailout on the complicated horizon with a Spanish-style Syriza, they have opted for the hard line. They consider it advisable to impose an “appropriate legal framework” and to deregulate police activities, which would confer total impunity on illegal practices that the police are carrying out without much media coverage, just as was authorized under the previous Law. And the new law even grants the police the authority to impose punishments that previously were under the jurisdiction of the Courts. It would seem that the arbitrary and disproportionate intervention of the police against “third parties” who engage in protest is, oligarchically speaking, the only way to guarantee “the normal functioning of the institutions” in the crisis and also of maintaining “the tranquility” of the citizens who make the decisions in the economy and politics. So that society and the State will continue to be in irresponsible and corrupt hands, the street must be at the mercy of the real violent elements: the cops [la madera]. The Gag Law is the first of its kind to define the concept of “civil security”: “the guarantee that the rights and liberties recognized and protected by democratic constitutions can be freely exercised by the citizenry.” This definition is easier to understand when one takes into account the fact that it is referring to the right to agree with the State’s orders and the liberty to obey them. This security legislation enlarges the index of “disturbing” acts and criminal behaviors in terms ambiguous enough to apply to a major sector of the population, the part that attends demonstrations, is disobedient, yells at the police, tries to prevent evictions, uses the Internet to organize impromptu demonstrations [movidas]; the part that participates in strike pickets, squats houses, blocks traffic, photographs the brutalities of the forces of order; the part that interferes with “the operations of critical infrastructures”, that is, the part that defends the territory, and even the football fan who is too rowdy and … those who do their drinking and partying in parks and public squares, etc., instead of at bars [hace botellón]: juvenile dipsomania is now subversive in the saintly eyes of our rulers. Everyone has a place in the net of punishment, from the fanatic jihadist to the modest citizen who does not think he is obligated to show his ID to some thug; from the pacifist who chains himself to a tree to block the construction of a High Tension Power Line, to the pedestrian who refuses to submit to a search; from the undocumented immigrant to the foreclosed homeowner who refuses to vacate his home. All of them are “offenders”, and as such will be subject to search, regardless of how minor their infraction is or their degree of guilt, because even if the latter is minimal, they may be considered to be opponents of the constitutional order, and therefore responsible for adding their grain of sand to the destabilization “of the political institutions, the economic or social structures of the State”. The Gag Law indicates that the particratic regime is ineluctably evolving towards an Orwellian society like the one described in the novel, 1984, with unilateral information, mass social control, repression of social activism, eradication of critical intelligence, Newspeak and ministries of oppression, where any sign of non-conformity can entail terrible humiliations. Obviously, today’s Big Brother is not the Party, but the particratic State; the slogans, however, remain the same: “war is peace”, “freedom is slavery”, “ignorance is power”. The Gag Law is a typical product of the Reason of State, for it constitutes another step forward towards an increase of power for the purpose of preserving the regime above its subjects, called “citizens”, regardless of the means employed to do so. Among such means, the immoral, arbitrary and violent will be favored, because, in the opinion of the ruling oligarchy’s experts in repression, they are the most effective. Ever since July 1, 2015, the partiocracy is now visibly what it always was essentially: a police State that greets its “citizenry” with a perfectly legal expansion of police powers without the need to resort to a coup d’état. Translated in July 2015 from the original text available online at: https://argelaga.wordpress.com/2015/07/06/la-ley-1984/. 1. “Ley de Seguridad Ciudadana” [Civil Security Law], also known as the “Ley Corcuera” or the “Ley de la patada en la puerta”, implemented by Spain’s Interior Minister, José Luis Corcuera, in 1992. In 1993, the Spanish Supreme Court struck down one of the Law’s provisions (authorizing the forced entry and search of residences for illegal drugs) as unconstitutional.